One doozy of a casting rumor just hit the newswire this afternoon. That and the latest from Guardians of the Galaxy Vol. 2 and Wonder Woman below! The casting news we’ve been waiting for is almost here, as Michael Shannon has been revealed by The Hollywood Reporter to be the current front-runner for the part of Cable, mutant from the future, in Deadpool 2. Shannon has experience with superpowers, having played the villain General Zod in Man of Steel, but this time he’d be closer to a hero role as the guy who goes on to lead X-Force. That means a multi-movie deal if he signs. Meanwhile, there’s also a rumor going around that Brad Pitt could be up for the same character in the sequel, and THR claims David Harbour is still on the list of contenders. It’s not surprising Wonder Woman has received a PG-13 rating from the MPAA, as that’s the norm for the DC extended universe, including Suicide Squad, and superhero movies overall lately. The reason given for its classification is that it’s for “sequences of violence and action, and some suggestive content,” and that sounds relatively safe enough for families to crowd theaters and enjoy the first major female superhero movie in a long time. The ratings administration’s website also lists a “Director’s Cut” of Wonder Woman that has been rated R “for some violence,” though according to the studio that is a rerelease of the 2009 animated feature of the same name. The PG-13 live-action movie starring Gal Gadot in the title role opens June 2. 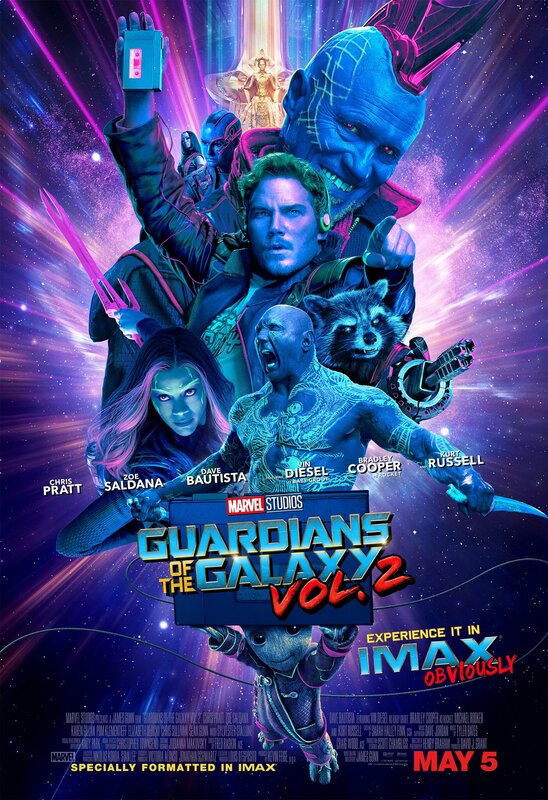 If you like your color schemes on the cooler side, you’ll love this new, predominantly blue-and-purple poster for the IMAX release of Guardians of the Galaxy Vol. 2. The whole gang is here, in varying sizes of importance, we presume. Actually, that would mean Yondu is the star this time around. Still, it’s symbolically correct that Baby Groot is represented as carrying the whole thing since he’s by far the biggest draw. That and the larger format projection of IMAX. As the poster says, you “obviously” need to see this as big as possible. The sequel hits screens both regular and IMAX size on May 5.